For serious off-roaders, the Jeep Wrangler Rubicon is the model to have. Unfortunately it's also very expensive; but this year's new Wrangler Moab offers many of those same features at a somewhat lower price. The 2013 Jeep Wrangler is just as ready for adventuring as it looks--and surprisingly tolerable for the commute. 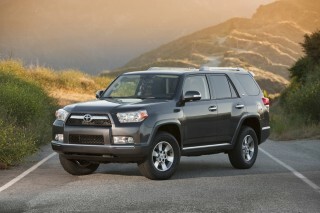 Automakers love to point to their vehicles and say that there's nothing like it on the market. That's usually utterly false, but in the case of the 2013 Jeep Wrangler, it's the whole truth. From the outside and conceptually, the Wrangler has been kept as true to its past as possible, within the bounds of vehicle regulations. Seemingly miraculously Jeep has managed to preserve features that will surprise you in 2013--like the ability to completely remove the top, or flip the windshield down. And within the iconic look, flat sheetmetal, exposed hinges, and toughness-on-wheels look is a cabin that looks more modern--and is far more comfortable than you'd guess. Two-door Jeep Wrangler and four-door Wrangler Unlimited variants are offered. A couple of years ago, Sahara trims get a new body-colored hardtop, and last year the new top scheme was extended to the Rubicon. Now for 2013 a new Moab edition has pretty much the same look, but without the Rubicon's front locker and super-low 4:1 'creeper' transfer case. Last year Jeep introduced its Pentastar 3.6-liter V-6 to the Wrangler, along with a new five-speed automatic transmission, and it's made this a A six-speed manual is still offer, too. But together, the V-6 and automatic combination can now dash to 60 mph in a much faster 8.4 seconds for the Wrangler Unlimited (or 7.7 seconds for the two-door Wrangler. There's surprisingly strong passing pep, and revs are kept low. About the only complaint we have is with the old (but very rugged) recirculating-ball steering gear and its dullness. Well, that and its 16-mpg EPA city rating. 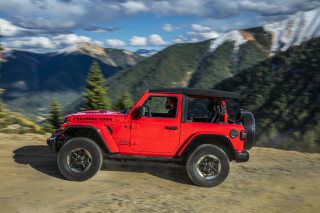 When you don't mind a little turbulence and wind in your hair, with the top removed (and even in some low-speed cases, the windshield folded down) the Wrangler can hit the spot, bringing the sensations of a convertible in a very capable off-roader—it's the only four-door convertible SUV. The removable tops are one of Jeep's best features—though they allow lots of road noise in the cabin, they can completely open the cabin of both the two- and four-door models, turning a hardtop Jeep into a convertible SUV. Jeep has improved its soft top design, making it much easier to use, and the Sahara's body-color hardtop is now offered in the Rubicon. The lineup includes base Sport, popular Sport S, showy Sahara, and super-off-road-focused Rubicon. Across the upper trims there's a wide range of choices in top configurations--including a body-color hardtop now offered in Sahara, Rubicon, or Moab form. Wrangler models can be equipped with air conditioning, navigation, automatic climate control, and streetwise alloy wheels. And this year, new Alpine speakers are available. Its utter flexibility, along with those options and others like Bluetooth connectivity, MyGIG music storage, Sirius Satellite Radio, heated seats, automatic climate control, and a hard-core off-road package have us still quite amazed at all that's offered—more than any other off-roader. The 2013 Jeep Wrangler costs as little as $23,190, but those base prices can be misleading, as Sahara and Rubicon models cost thousands more, and you'll want a number of options to make the off-road package (and appearance) complete. At the top end, Rubicon models can top $40k--a price point that could create a little anxiety if you're headed out to scrape against boulders and brush. The 2013 Jeep Wrangler has a modern SUV look inside, but that's hard to guess by its classic, instantly recognizable exterior. With a clear line of heritage going all the way back to the original Willys Jeeps, the 2013 Wrangler is iconic, unique, and very rugged-looking. There's no other model that looks like it on the outside. In truth, very little has changed about the exterior of the Wrangler in recent model years. Its flat sides, trapezoidal wheel flares, and seven-slot grille all hark back to a time when it was a lot harder to sculpt sheetmetal--and perhaps easier to pound it back to its original shape. Meanwhile, details like the removable doors, outside door hinges, and a fold-down windshield all reach deep into the Wrangler's military-truck heritage and trail-ready pedigree. Inside is where the Wrangler isn't nearly as rigidly observant of the past--and that's a good thing. The Wrangler has changed quite significantly in recent model years, with the drab, hard-plastic dashboard and trim of a few years ago now history, and instrument panels and door panels now nicely contoured. Trims have also been freshened and given a bezeled or machined look, and the look and feel is way more sophisticated while keeping the brief, upright, and businesslike look of the dash. Elbow rests and other areas have soft-touch padding, whilethere's new interior courtesy lighting underneath the instrument panel and in the cupholder areas. The 2013 Jeep Wrangler pairs awesome off-road prowess with decent road performance--except for the dull steering. If you're prepared to hear that the Wrangler drives like the vintage off-roader it's modeled after, you're in for a surprise. Last year Chrysler replaced the Wrangler's ancient V-6 with the company's new Pentastar V-6 plus a new A580 five-speed automatic transmission, and oh what a difference it made—especially on the highway. The 3.6-liter V-6 produces 285 horsepower and 260 pound-feet—or about 40 percent more horsepower and ten percent more torque than the previous engine—and with the automatic transmission (a piece of hand-me-down hardware that's been used in vehicles ranging from older Mercedes-Benz models to the new Jeep Grand Cherokee) it shifts with a smoothness and near-seamlessness in light to moderate acceleration. The Pentastar has lots of torque down low and will rev all the way smoothly to redline, with no flat spots, balks, or odd vibrations in between. And Wrangler models are surprisingly quick. Four-door Wrangler Unlimited models can get to 60 in about 8.4 seconds, while two-door Wranglers can make the dash in 7.7 seconds. Some are going to prefer the greater control of a manual transmission in the Wrangler, but it's more of a throwback to the Wrangler of yore; with its long throws, long pedal travel, and some vibration (but tight and precise linkage), it feels like it's borrowed from a muscle car. Whether you opt for the automatic or the manual though, ratios are extremely tall in the high range--an automatic model with the base 3.21:1 ratio, for example, only needed to shift once on the way up to 60 mph. A low 4.10:1 ratio is still available in the Rubicon. The 2013 Wrangler rides like a truck, but noise and vibration are well under control for such a rugged rig. The 2013 Jeep Wrangler can be had either as the two-door Wrangler, or as the four-door Wrangler Unlimited. Between these two models, the Wrangler Unlimited models adds 20.6 inches of wheelbase (116 inches), giving them the most cargo space ever in a Wrangler, and a larger rear-seat design. That leaves the Unlimited feeling like a pretty spacious utility vehicle inside. 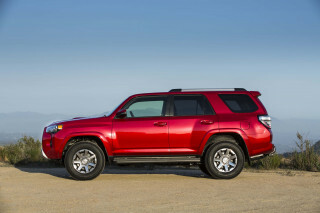 There's just enough backseat space for adults in back, and while we've called front seats merely adequate in the past, Jeep has re-contoured both the front and rear seats, with larger off-road-friendly bolsters, for 2013. So we'll update you as soon as we get some extended time with one. Last year Jeep brought the dash and trim of the Wrangler up to the 21st Century—it no longer feels as if it was pieced together military contractors raiding Chrysler's parts bin and skimming the top. But there are some details that you might either find endearing or off-putting. For instance, the doors completely lack detents, with only a fabric retainer strap limiting their travel. And on manual-transmission models, there's no dead pedal on the far left to rest your foot; instead, the three pedals are large and widely spaced; surely, you could drive the Wrangler with hiking boots. And don't forget that, unlike any other vehicle on the market, the Wrangler lets you (in private, low-speed use) fold the windshield forward. Several electronic aids help increase the Wrangler's safety on the trail, but on-the-road safety isn't stellar. The 2013 Jeep Wrangler might be surprisingly compatible with family use or daily driving than you might have suspected, in most ways, but safety is still a red flag. The Wrangler does come with quite a few safety features—including anti-lock brakes and stability control, plus two off-road aids: Hill Start Assist (HSA) to prevent rollback on graded surfaces, and Trailer Sway Control (TSC), which monitors vehicle movement relative to the intended path. In the utilitarian-looking Wrangler or Wrangler Unlimited, you can get all sorts of features that you wouldn't expect to see--albeit at a steep price. Seen only from the outside, the 2013 Wrangler tends to trick you into thinking--with exposed door hinges and other rugged details--that there's not much softness or convenience within. Not so; Wrangler models can be equipped with air conditioning, navigation, automatic climate control, and streetwise alloy wheels. And this year, new Alpine speakers are available. The Wrangler model lineup includes the base Sport, the popular Sport S, showy Sahara, and super-off-road-focused Rubicon. Across the upper trims there's a wide range of choices in top configurations--including a body-color hardtop now offered in Sahara, Rubicon, or Moab form. 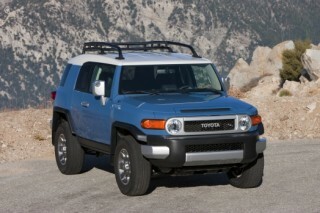 And for 2013 the soft-top design has been revised so that it's easier to raise and lower by one person. In any case, the Wrangler offers several features that other SUVs can't match--like the opportunity to completely remove the top, or to flip down the windshield at low speed. 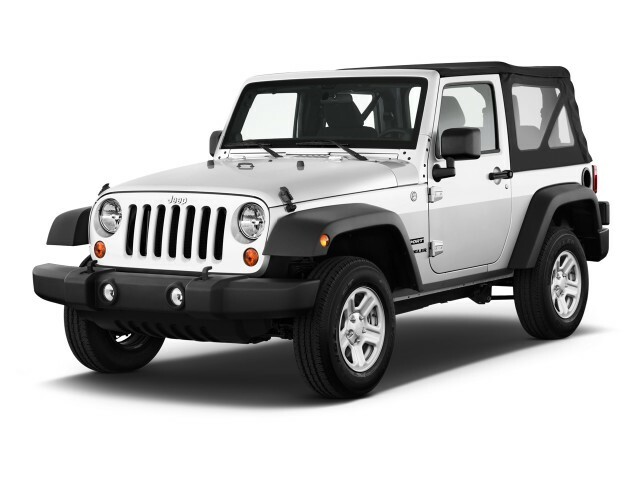 The 2013 Wrangler is thirsty for a vehicle that has relatively little passenger space; but that might be forgivable if you're using all its trail ability. Fuel efficiency is in all honesty a low priority to most people who would consider buying a Jeep Wrangler. Those who might still be looking at the EPA numbers need to consider that it's not a replacement for a crossover or other family vehicle--especially if you want to keep the fuel budget under control. All of this is, of course, if you plan to do a long commute daily in the Wrangler. 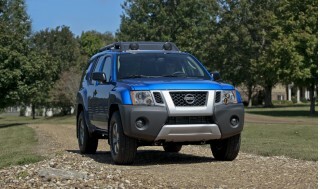 If it's the weekend off-road toy, or the backup vehicle, a city rating of 16 mpg could be much easier to stomach. And last year's engine transplant to the Wrangler did significantly boost its mileage, by up to 2 mpg.